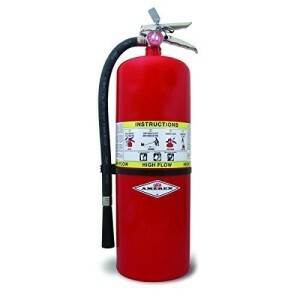 All Florida Fire Equipment sells and services high flow fire extinguishers. A High Flow Fire Extinguisher should be installed anywhere that a three dimensional fire hazard is present. These fire extinguishers are perfect for propane filling stations, gas stations, paint booths, automotive repair facilities, marine terminals and construction sites. High flow fire extinguishers discharge faster so they help extinguisher the fire faster. A high flow fire extinguisher also shoots further so you do not have to be as close to the hazard to extinguish the fire. Currently High Flow Fire Extinguishers are available with either ABC, BC or purple K powder in them. We currently offer high flow fire extinguishers from Amerex and Pyro-Chem. They are both leaders in the fire protection industry.